That’s why I’m so annoyed by Fox Movie Channel’s decision to cancel its Charlie Chan film festival this summer, after an Asian-American organization stirred up this ancient hornet’s nest. They don’t like the fact that Charlie Chan was played by Caucasians. Fair enough, but what do we accomplish by taking those movies out of circulation? Do we convince young Asian-Americans that such casting never existed? Moreover, does anyone gain anything by wiping this piece of movie (and social) history off the map? Why should we obliterate the good work of such Asian-American actors as Keye Luke and Victor Sen Yung, who played Charlie’s sons so well? As a movie buff, I feel especially sad. 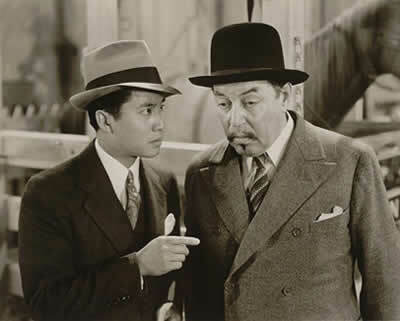 I’ve loved the Charlie Chan movies since I was a kid; they’re enormously entertaining. And unlike many other ethnic groups who have a valid complaint about their portrayal in films gone by, Asian Americans have in Chan a genuine hero—a warm, wise, witty crime-solver and behavioral psychologist who is invariably smarter than any white man in the movie. If this is racial slander, I must confess that I just don’t see it. But for now, he has been silenced. With him goes a chunk of Hollywood history, a prime piece of popular culture, and an opportunity to learn and grow. whats wrong with this world today.we need to kill off everyone and start over again. Well, if it weren't the Asians protesting, it would be Jesse Jackson and Al Sharpton. Charlie Chan had a black chauffeur and assistant named Birmingham Brown, who created laughs when he acted scared in a sterotypical fashion of that era. This guy is spamming all the blogs. Back to the subject: I loved the Charlie Chan movies too. Apparently I was supposed to grow up thinking Asians were... whatever, inferior? but instead I grew up having massive crushes on Asian actors and becoming a real fan of Asian culture. I used to check out all the books in the library on China, Japan, and the rest of the area, and anytime a movie came on that features Asian actors I had to watch it. And Hawaii 5-0 was my favorite show. Somehow all of this is supposed to indicate my native whitegirl prejudice. Well it does -- I remain favorably prejudiced towards Asian culture.